An Android malware is spreading around WhatsApp messenger called 'Priyanka'. It changes all your groups names to Priyanka, and may also change your contact names to Priyanka. Apparently, the malware doesn’t actually harm Android devices, but it is very annoying and it spreads manually, relying on victims to accept and install a contact file from a friend, named "Priyanka,". Just in this week this virus started infecting WhatsApp users. 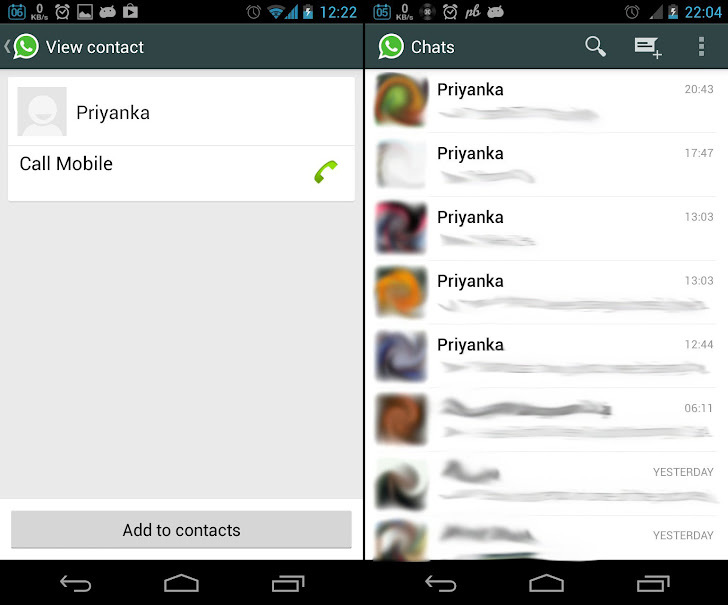 If you receive a contact file from a friend, named 'Priyanka' and install it, your WhatsApp will be infected. If you receive the contact file but don't accept it, nothing will happen. Once done. Open Whatsapp on your phone and it’ll show up as you’ve just installed it again. Go through the setup and in the end it will automatically start restoring your conversations. So next time when you receive such contacts which you don’t expect from your colleagues just discard them. Update: Website called 'Theandroidsoul' first spotted this malware and claimed existence of this malware. But none antivirus firm or any security professional yet have seen this malware.